think about what information can help you decide. 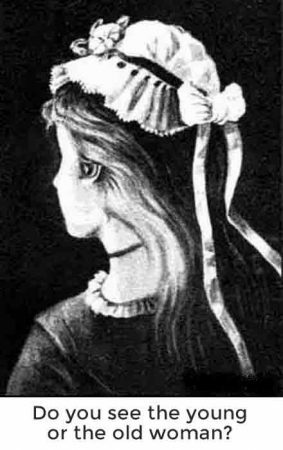 What do you see—the wife or mother-in-law, in the image on the right? There is help at hand. There are many simple management tools for founders that you can use to facilitate both understanding and decision making—on setting strategy and monitoring performance. I suggest you take a look at them all to get an overview. Then when you face something tricky you will probably remember one of them that you can put to use. if the issue is complex and you need to put some shape into thinking or data. You will probably find, as I have done over the years, that you will use more than one tool to deal with a single issue. Don’t be afraid to mix and match. Some of the many management tools for founders in the list below are in the public domain and others I have created myself, based on long and painful experience. This is a list of management tools for founders, which I have found useful on the entrepreneurial journey. There are surely many others. Please tell me about your favorites that are missing. AND if you see errors, or things that you don’t understand, likewise, please let me know for the benefit of all users.